The selection of a material when manufacturing any component is a critical decision. Many things must be taken into consideration including material compatibility, application, environment, oil supply and quality, and many others. Some manufactures have in recent months have decided to use a material that is advertised as “Self Lubricating”. The true definition of Self Lubricating Material is: Must provide its own lubrication throughout the life of the system and not have some external source facilitating lubrication for that period of time. Obvious a pushrod has an expected service of 2 to 5 thousand hours and common sense says some lubrication source other than the material it’s self must be used. So our question is “IS YOUR MATERIAL REALLY SELF LUBRICATING”. 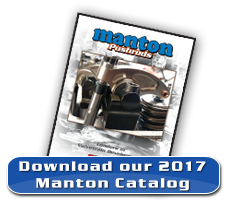 At Manton Pushrod we prefer to make our decisions based on facts, and in the case of material selection we look at several basic things. The application, material compatibility and lubrication sources and the Coefficient of Friction of each paired materials. 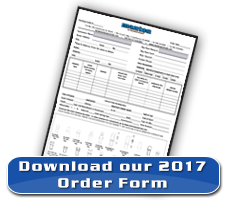 In the case of a pushrod end we will select either a case harden able bearing steel or in an application that incorporates excessive valve spring pressure and engine speeds in above 10,000RPM and very high cylinder pressures, we will select a tool steel material that shows good compatibility with the mating part. In many naturally aspirated applications we will use a pushrod end for the rockerarm adjuster that incorporates a Copper Alloy insert. This combination produces a Coefficient of Friction number of .50 dry and .16 lubricated. This has proven to be a very good combination. Also note that steel mated with steel has a Coefficient of Friction of .80 Dry and .16 lubricated. As you can see the lubricity of both combinations when lubricated are the same, but when dry the steel on steel coefficient is much higher than the copper on steel combination. This dry condition occurs during start up and at any time the engine speed is low, such as during idle. This is the reason we highly recommend using the Copper Alloy Pushrod Cup along with an H13 Tool Steel Adjusting Screw. We also would like to point out that the ductility of the Copper Alloy Cup allows the adjuster ball and pushrod cup to mate in a more consistent pattern providing an increased and more uniform contact surface area thus creating a “perfect fit”. ANY combination of materials in this application will require an ample supply of high quality oil. The main function of the engine oil is not to provide lubrication, but to remove heat. Any material advertised as “Self Lubricating” requires the same amount of the same high quality oil — PERIOD.